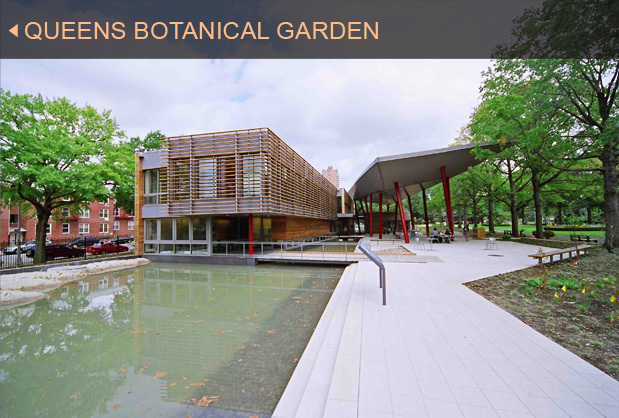 Green Building, Green Building Projects, Queens Botanical Garden, Clivus Multrum Inc. Located in the densely-populated Flushing Meadows section of Queens, New York, the city-owned Queens Botanical Garden (QBG) provides its 330,000 annual visitors with a change of pace from the usual sights and sounds of city life. Visitors can enjoy and learn from the Wetland Garden, Woodland Garden, Bee Garden, and more. And while QBG is already known for expressing remarkable horticultural diversity in its displays, it is rapidly building a reputation for its efforts to protect the environment. The centerpiece of the first stage of the Garden's Master Plan, the Visitor & Administration Building, was completed in 2007. This 16,000-square-foot building, designed by BKSK Architects, was built to achieve a LEED Platinum rating. The use of Clivus Multrum composting toilet systems for this urban, sewered location shows both the city's commitment to creating environmentally responsible buildings and the growing interest in the use of composting toilets in high-traffic, multi-use facilities. The Clivus system at QBG is designed for staff use. The Foam-flush toilet fixtures use only six ounces of water for flushing and represent a potential savings of sixty-two thousand gallons of water per year, as compared to 1.6-gpf toilets. While the new facility also uses a number of conventional fixtures, the combination of the composting toilets and the use of greywater for flushing all toilets keeps a substantial amount of wastewater out of New York City's already overloaded, combined sewer/storm drain. Other green features of the building are geothermal heating and cooling, rooftop solar panels, and a green roof.